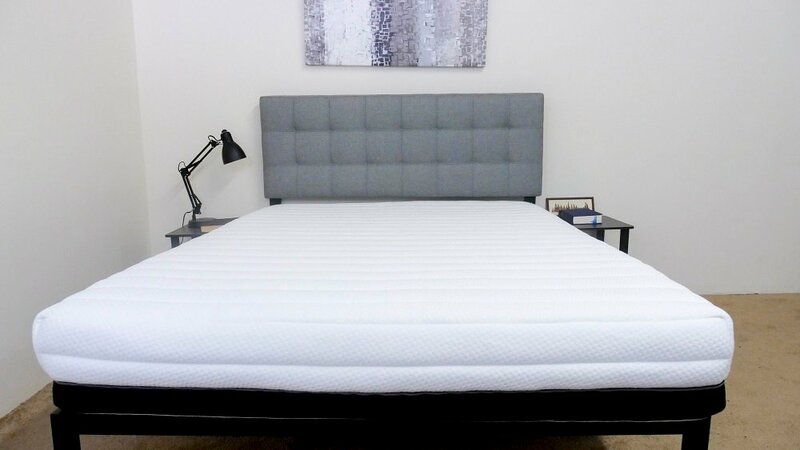 Luxi 3-in-1 Mattress Review | Will an Adjustable Bed Find Your Fit? 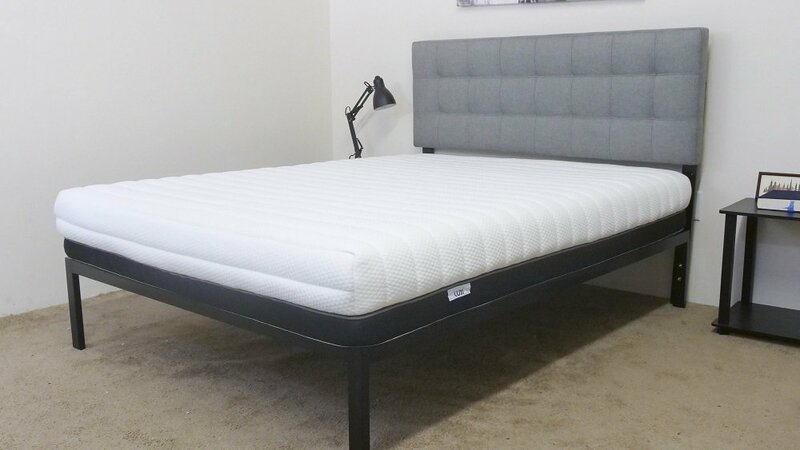 I’m super excited about today’s review because I’ll be taking a look at a pretty unique product in the sleeping sphere: the Luxi Adjustable Bed. As the name suggests, this mattress is fully customizable, allowing sleepers to modify the foam layers to fit their preferences. Sound too good to be true? Maybe, but I won’t know until I put this bed through my series of rigorous tests, checking to see how it sleeps and feels to figure out if it could be the perfect mattress for you! Continue reading below for my full review of the Luxi 3-in-1 mattress. Don’t have time to read it all? Click here to skip to the bottom and check out my review summary. 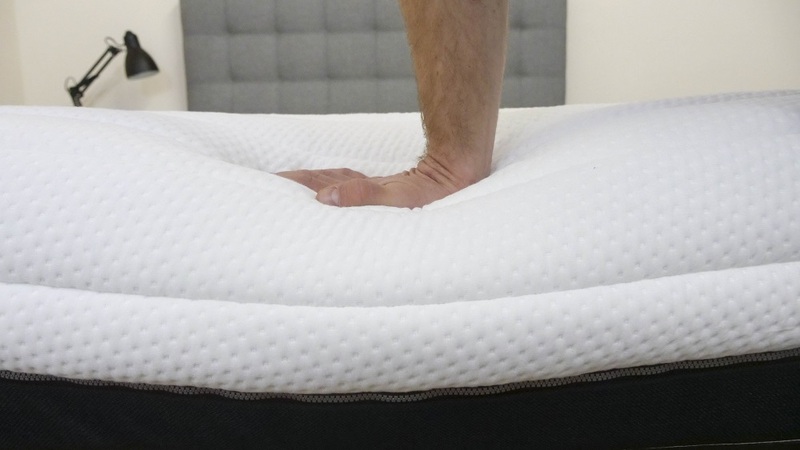 As I mentioned up top, the Luxi 3-in-1 is a bit unusual in that its four foam layers can be moved around depending on how you sleep. That means the bed can be modified to be either soft, medium firm or firm, all based on how you order the different sections. For the purpose of this review, I oriented the materials in the “soft” design, but just know you could customize this mattress to feel exactly like you want it to. Now, to figure out how this all goes down, let’s take a peek at these different layers. Cover – The cover is constructed with a mixture of polyester and viscose, an absorbent material that helps promote cooling. 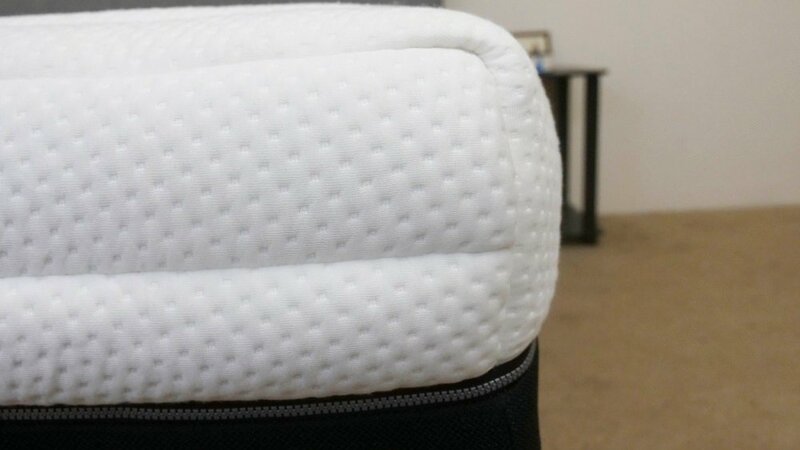 This section is also quilted with a small amount of memory foam, which provides immediate relief and comfort to the sleeper. 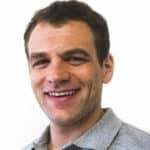 Comfort Layer – In the soft iteration, the comfort layer is made up of what Luxi calls its SBT layer. The acronym stands for “support, bounce and technology,” clueing the sleeper into the fact that this material is firm and responds quickly to pressure. The technology component refers to the small series of channels that run through this section, providing pockets for airflow and body contouring. Pressure Relief Layer – Below the comfort layer, you’ll find 1” of memory foam. This material responds slowly to pressure and doubles down on the contouring of the comfort layer, extending it through the mattress as you sink deeper into the structure. 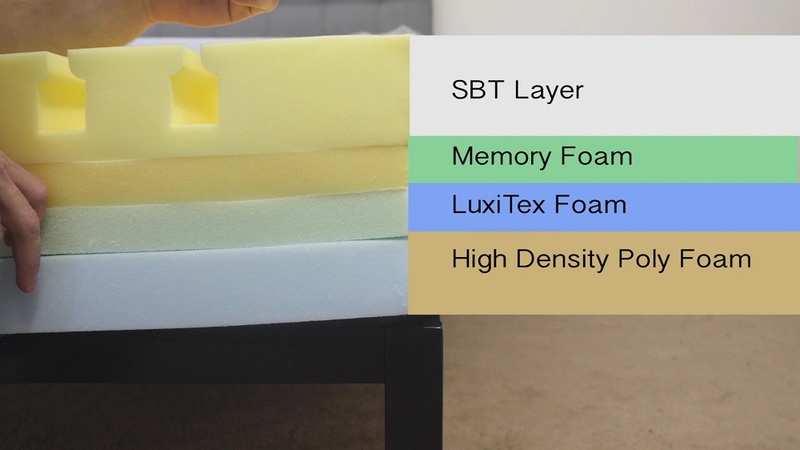 Support Layer – Next up, we’ve got 1” of the brand’s proprietary LuxiTex foam, which is most similar to latex. Like the latter material, the LuxiTex foam is great at keeping things cool and has a quick response to pressure, which will help lift the sleeper up and out of the bed. Keep in mind that if you wanted the medium firm feel, this layer would be on top. Foundation Layer – And finally the base of the bed, which is comprised of high-density poly foam. This section gives the mattress its durability and supports the softer top foam layers above it. If you want the firm version of this bed, this layer would be on top, followed by the SBT section and then the remaining layers. After taking a look at the construction of the Luxi 3-in-1, let’s chat about the firmness and feel. I should note that for Queen sizes and above, the adjustable bed actually features split firmness levels, which allows you and your partner to tailor each side of the bed to meet your individual sleeping needs. So, if you like it firm while your bed mate likes it soft, you’ll both be able to make this mattress work for you. I’ll reiterate that I’m looking at the mattress in its soft configuration, so as I describe the feel of it below, know that this could change if you were to make any of the above modifications to the structure. When I first pressed my hand into the mattress, I was immediately interacting with the soft memory foam quilted into the cover. The materials contoured nicely to my hand, providing me with instant pressure relief. Pushing in further, I encountered the SBT layer, which lengthened the contouring of the cover into the rest of the bed while also providing me with some pleasant bounce. At this point I’d like to note that people of different body types and shapes will feel firmness differently. Rather than giving just my opinion on the overall firmness level of the Luxi 3-in-1, I enlisted three other people to give their opinion as well. This will give you a better sense of the firmness range you can expect from the mattress. As you can see in the graph above, my testers were pretty much in agreement about the firmness of the Luxi, giving it an average rating of 6.9. When compared to the industry standard of 6.5 for medium firmness, this bed appears to be medium firm. I personally gave the mattress a 6.5 because while I did experience some nice sinkage from the quilted cover and SBT layer, I never felt stuck in the mattress. This mix of pressure relief and support makes for an even feel that should satisfy a wide range of sleepers, especially those who prefer to sleep in multiple positions. Again, if you’re on the search for something firmer, you’re welcome to play around with the layers until you land on the combination that works best for you. Rather than just describing the feel of the Luxi 3-in-1 to you, I wanted to give a visual representation of where someone may feel pressure points form while lying on it. To do this, I placed a pressure map on top of the mattress and lied on my back, side, and stomach. You can see the results on the image below where pressure is represented from blue (low pressure) to red (high pressure). Back – Lying on my back, I felt that my weight was evenly distributed across the surface. The quilted cover filled in the space at my lumbar region nicely, which helped to alleviate any pressure that might’ve formed in that area. I’ll add that it was easy to move around on the bed and I never felt stuck in any one position. Side – Rolling onto my side, I didn’t feel the formation of any major pressure points. The SBT layer did a fantastic job of supporting my hips and shoulders, typical problem areas for side sleepers. I was able to really sink into this section, which helped to relieve any tension I might normally feel in this position. Stomach – On my stomach, I didn’t feel any pressure at my chest, which is a great thing for stomach sleepers to note. I didn’t feel as though my hips were sinking too far into the mattress and the supportive foam up top helped to keep my spine in a nice alignment. This next test is intended to demonstrate the intensity of motion that is detectable across the mattress, which will be especially important if you plan on sharing your bed with a partner and need to know if their midnight movements will ruin your sleep. As you can see in the graphic above, the Luxi 3-in-1 experienced pretty average motion transfer. While the SBT layer did help to dissipate some of the interference across the entire surface of the structure, the bed’s all-foam construction inhibits it from really being able to dissipate a ton of movement. All that being said, while you are likely to feel your bed mate moving around at night, the disturbance isn’t going to be that massive. When buying a new mattress, most people want to know whether or not they’re going to be sleeping “on top” of the bed or “in” it, so I’m going to run a quick sinkage test on the Luxi 3-in-1 to figure out just that. To give you a visual sense of what this sinkage will look like, I placed four balls of varying sizes and densities (a 6 lb medicine ball, a 10 lb steel ball, a 50 lb medicine ball, and a 100 lb medicine ball) on the mattress and measured how much they compressed the surface. The different sizes, weights and densities of the balls are meant to simulate different body parts and different sized sleepers. These are fairly dramatic results for this test, which tells me that you’re bound to experience a lot of sinkage when you sleep on the Luxi 3-in-1. 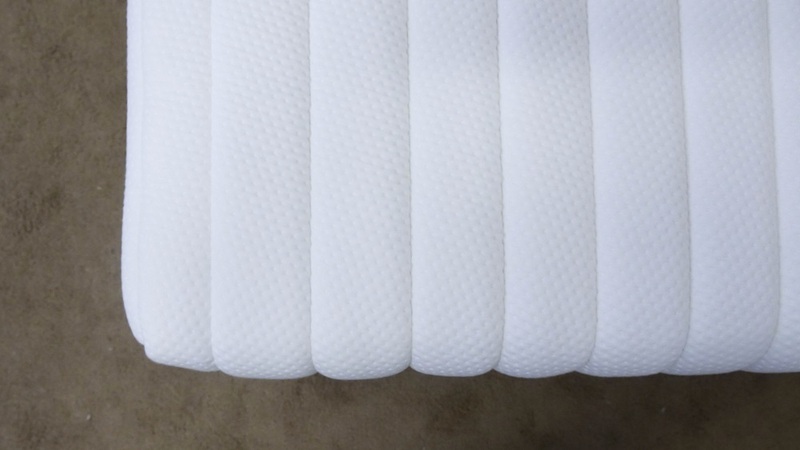 The deep sinking of the lighter balls show the effects of the quilted cover and contouring SBT layer, while the heavier balls are interacting with the memory foam and proprietary LuxiTex foam in the core of the mattress. This pressure-relieving sinkage will be great for a lot of sleepers, but especially for those who doze primarily on their sides. Also keep in mind that if you want more or less sinking, you can always reverse the order of the foam layers to achieve your own tailor-made sleeping synergy. And finally, let’s consider the Luxi 3-in-1’s edge support, which will be crucial for those of you who are going to share your mattress and need to use the entire surface area of the bed. Lying on my back near the edge of the bed, I felt about as supported as I did in the center. As I scooted closer to the side of the mattress, I detected compression through the top foam layers, which you can see in the picture above. While the SBT section in particular really contoured to my body, I never felt insecure in this position. I continued to experience this compression when I rolled over onto my side. As you’ll notice in the photo, the top foam layers really hugged the curves of my body here, shaping to cradle my hips and shoulders. For all this sinkage though, I still felt solid at the edge of the bed. In this position, I wanted to simulate what it would feel like to be sitting on the bed in the morning when you’re lacing up your shoes and getting ready for the day. A lot of foam mattresses experience severe compression in this position, and the Luxi was no exception. That being said, I still felt secure sitting on the side. If you’re convinced the Luxi 3-in-1 is the right mattress for you, the size and pricing information for the mattress are below. Please note that these prices reflect standard pricing, but coupons are often available. 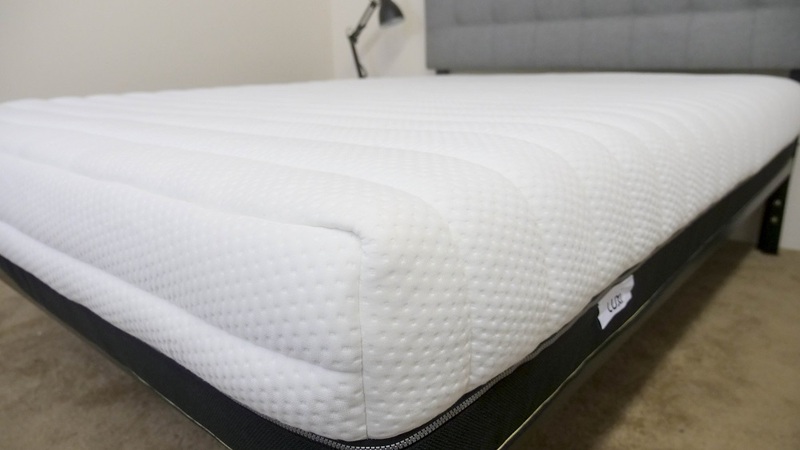 IS THE LUXI 3-IN-1 MATTRESS RIGHT FOR YOU? Now that we’ve taken a closer look at the Luxi mattress, it’s time to discuss who it’d be a good fit for. Looking for adjustability – Obviously, one of the coolest features of the Luxi is how customizable it is, so if you’re unsure of what kind of firmness you want or like to change it up, this could be a great bed for you. Couples – This mattress could also be a good pick for couples because of its split foam construction, which allows you to fully adjust each side of the bed to a sleeper’s unique preferences. Prefer to sleep in multiple positions – The SBT layer does a fantastic job of supporting weight in a number of different positions, which ensures that you’ll feel plenty of pressure relief regardless of how much you toss and turn in the night. The Luxi is one of the more unique mattresses I’ve tested on Sleepopolis. The ability to fully remove the cover and swap around layers to create different firmness levels is quite interesting. The combination of memory foam and latex provides a pronounced level of sinkage and hug, as well as pretty good response time. All in all, the Luxi is a good choice for sleepers who don’t know what firmness level they want / need, but know they enjoy more of a traditional memory foam level of sinkage and hug.